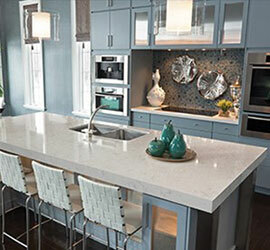 Countertops | Jacksonville, FL - Empire Surfaces, Inc. Creating a standout style in your home starts with the details. When you are ready for a change in your kitchen or bathroom, turn to us to discover your options for countertops in Jacksonville, FL. At Empire Surfaces, Inc., we offer a full selection of stunning materials that make your space stand out for all the right reasons, including quartz and granite. No matter what your personal design preferences are, you will find the perfect kitchen and bathroom countertops to fit your tastes. Visit us to start the design process for your home. Add the perfect finishing touch to your kitchen and bathroom when you shop with us for a set of quality countertops. Our countertops are made from the finest materials available and can be customized to fit your color and style preferences. We proudly feature a range of unique options for homeowners located throughout the region. Is it time for a change in your home? While many homeowners do not believe that it is worth it to spend money on their bathrooms, this small space packs a significant punch in the overall design of a residence. The bathroom is one of the most widely-used rooms, and nearly anyone who enters the home sees it. From master baths to guest bathrooms, we offer a series of quality countertops for rooms of all sizes. Our countertops and stainless steel sinks can take your space from boring to beautiful at a price that fits your budget. Speak with us to create a stunning new setup for your family and guests. Each day, you spend a lot of time in the kitchen. Whether you love to cook or entertain, you likely use your kitchen for a variety of different reasons. Create a space you are proud to show off when you turn to us for your new kitchen countertops. Making your kitchen stand out does not require a lengthy remodeling project. By installing a new set of countertops, you will enhance the atmosphere of your space with ease. New countertops will not only give you the extra room you need to prepare your meals on, but they will also add a fresh feeling throughout the room. Whether you have a modern or traditional kitchen setup, you are sure to find the perfect addition when you shop with us. Our products are available in some colors, with options to fit every design. Contact us in Jacksonville, Florida, to learn more about your options for new countertops. We create pieces for homeowners throughout the area.